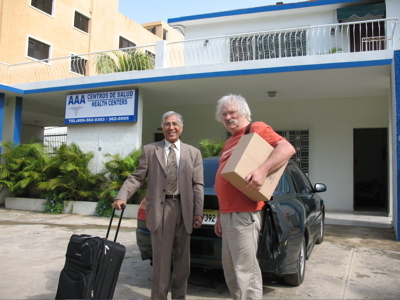 Dr. Shakil Kahn, who practices in Santo Domingo, Dominican Republic, contacted me as a representative of Homeopaths Without Borders. He was aware of our trips to Cuba and thought that I could provide assistance to him in making remedies. Dr. Kahn who is of Indian descent, was trained as a homeopath in Canada; he speaks fluent English. 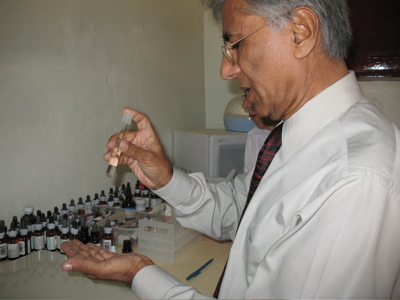 At his clinic he treats mostly poor patients using natural methods, including homeopathy. Dr. Kahn knows homeopathy works, but his access to remedies is very limited by financial constraints as well as the fact that homeopathic remedies are not available in the country. Also, the mail system does not work well. In theory, he could fly to the United States to obtain what he needs, but that requires fund he doesn’t have. Through Washington Homeopathics, we sent remedies and books to Michigan when he traveled there. However, it became clear that the only way to really make sure he had a supply of remedies was to show him how to make the medicine---telling him how to make homeopathic medicines via e-mail simply wasn't going to get it done. Thus, Linda, my wife, and I were invited to the Dominican Republic by Dr. Kahn and his wife (who is a native Dominican). We paid for the flight and they offered to pay for accommodations, a good deal that avoided using precious Homeopaths Without Borders money. We carried with us 50 pounds of remedies, kits, books, etc. We encountered no problem with customs—they didn’t look at anything. Dr. and Mrs. Kahn met us at the airport and took us to where we would be staying: a casino! We had a late dinner and went to bed. The next day we were picked up and taken to their clinic where we took a tour and gathered a pile of background information. We surveyed what he had and what we brought to do the job (e.g., mortar and pestle). That about wiped out the first morning. For the afternoon we headed out to buy what we needed to sustain production. We kept this routine for three days and ended up finding the right lactose, alcohol, label paper, 10 ml vials, graduates, pipettes, bottled water (he had), and price tags (for tops of labels). He had a nice room for our project and was going to get a bureau to put remedies in, cap side up. He didn’t need a heat gun as he had a microwave to “purify” the mortar and pestle. We had trouble finding pills, but plenty of sucrose was available.It was fairly easy to come up with these things compared to our problems in Cuba where it had been virtually impossible to gather most items. There were some oddities: getting the alcohol required us to order it in one place, pay for it in another, and then pick it up in another—all in different buildings. On the third evening Dr. Kahn and his wife and two sons made Sepia 29c and 30c from tincture. Homeopathy is hard to believe – making something into nothing and finding it “stronger” as you go along. Luckily Dr. Kahn and his family all knew that Sepia works. Dr. Kahn uses a lot of Sepia 30c for his patients, as well as Pulsatilla 30c, and was concerned about running out. After making the 29c and 30c, I think he realizes that by having the tincture, he will not have to worry about running out. The next morning we did some trituration and then it was off to the Hilton’s beach resort. It’s a bit hard to believe: going from Santo Domingo, a big city (I wouldn’t drive there for anything) to a resort with all the trimmings. We received a brochure from Dr. Kahn that described a homeopathy seminar anyone could attend covering topics from A to Z – actually Acne to Varicosas. It was for Mayo (May) and Junio (June) and totaled 99 classes (3 hours for $10.00: not bad). I think any enterprising U.S. clinic would do well to provide such a service. For some classes there were only 3 or 4 attendees for others there were 30. All in all, our adventure went smoothly, especially when factoring in that the city was building a subway along the two-way street where Dr. Kahn’s clinic is. While we were there a huge 12′ hole, street-wide was dug, right past the clinic’s driveway. The last morning we were there, you could barely walk out and no cars could pass. We went from having all the amenities: electricity, A/C telephones, etc., to having the clinic’s back-up battery system keeping minimum things humming. I think Dr. Kahn was amazingly cool considering the total disruption.